Sizing for a Perfect Fit! Note: Sizing Information: The SafeNSound Strapz™are the only product that requires a size. All of the clips are one size fits all. 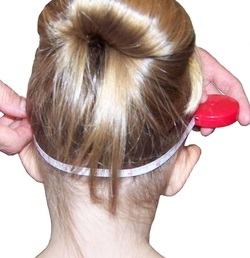 However, you can order a clip in size infant with a smaller adjustment bead and 2" shorter for little heads. For proper fit measure from top of one hearing aid or Cochlear Implant BTE Processor, loosely around base of skull to top of other device. If you are in between sizes, choose the smaller one, or better yet, ask for a custom fit in the special instructions section of our order form. The size you order will be the SMALLEST size; your strap will adjust up to 2" larger, but will NOT adjust smaller! For small aids: Unscrew J-hook from aid, slide silicone loop over hook and slide PVC ring to tighten. Replace J-hook and repeat on other aid. The strap comes in sizes Newborn-6", Infant-7", Toddler-8", Child-9", Youth-10", and Adult-11". If you have any questions, please feel free to call us. You are our top priority! For eyeglasses/sunglasses: measure from the part of the bow that reaches behind one ear, around the base of the skull and up to the same spot on the other bow. If wearer uses large aids, you will want to use the same method to measure, but begin at the center of the aid so that the strap can be attached at the largest point of aid to keep securely in place. You may need to adjust with use to find the best spot. For large aids: Slide silicone loop over the top or bottom of the aid and slide to the center of the aid to the point that seems to hold the aid in place best. If you find that the adjuster slide prevents you from stretching the fitting loop to fit your aid, simply slide to remove it, which should make the fitting loop stretch to accommodate even the largest aids and cochlear implant processors. Depending on whether you are using our product for use with BTE hearing aids/cochlear implant processors or with glasses will determine how you measure. If measuring for a small child, you may want to use a string or dental floss or something similar in flexibility and then lay it down on a ruler or tape measure to check the size. If measuring for glasses, start at the part of the bow of the glasses behind the ear, go down around the base of the head and up to the same point on the other side. If measuring for BTE hearing instruments, start at the top of the aid for small hearing aids, or the center of the device for large hearing aids, FM or Cochlear implant processors, down around the base of the head and up to the same point on the other side.